Back in May we took a trip to the South coast of England and to the popular seaside town of Brighton, part of the city of Brighton & Hove. We’ve already shared with you our experience of Choccywoccydoodah, but it’s not just sweet treats and chocolate that Brighton does well; it’s also a bit of a foodie hotspot. The cobbled lanes and streets of Brighton are lined with an array of trendy cafes and bars, and some hidden treasures when it comes to finding that perfect place for an evening meal. Once such treasure was the French influenced Côte Restaurant, which is located opposite the popular Brighton Dome. We arrived to Côte pretty much by chance as we were looking for somewhere to enjoy an evening meal. When we walked in, there was only one or two tables free, with the restaurant really busy – it was Friday evening after all. It’s always a good sign of a restaurant’s popularity when you see it busy, so we were only too happy to wait a few minutes to get a table. 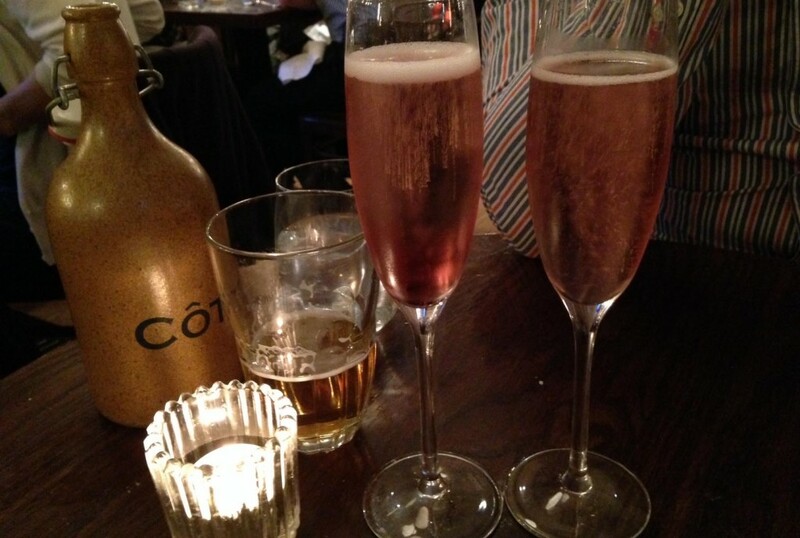 The team at Côte were extremely accommodating and we weren’t standing about for long. We were shown to a cosy two person table, and sat down to take a look at the evening menu – it was a mouthwatering experience! As you’ll probably have guessed, we both enjoy our desserts, so when it came to looking at the Côte menu, we decided to go for a main course and dessert. 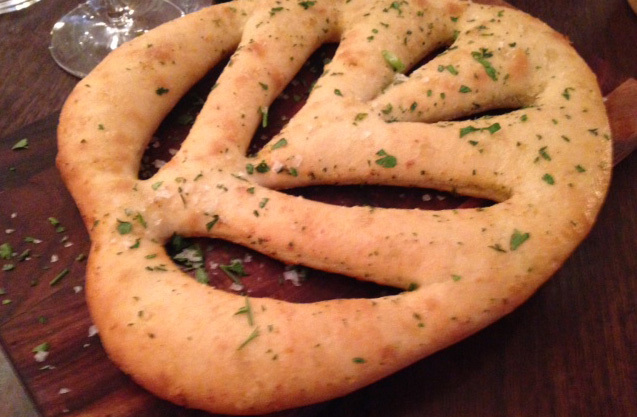 We decided to share a bread starter though and went for Fougasse bread, which is a leaf shaped garlic bread with parsely and sea salt. We had never thought of adding coarse sea salt to garlic bread but it really enhanced the flavour and is something we will certainly be trying at home. We’re all used to getting served complementary water in restaurants, but Côte took it to the next level by serving us water which was purified and chilled using their own carbon filtration system. The water was served in branded clay bottles that were reminiscent of old time beer bottles. The bottles were replaced at every course. I know it may seem strange to be impressed by something as simple as a glass of water, but this water had an unbeatable clarity and pure taste. Nial is a big fan of duck and is always on the look out for duck when we eat out. 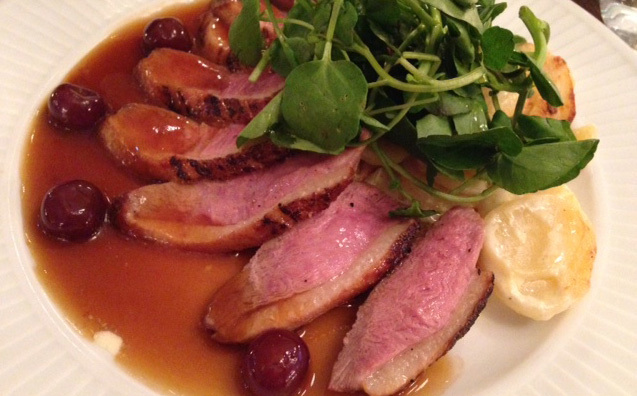 Once he spied it on the menu, there was only ever going to be one winner – the duck! 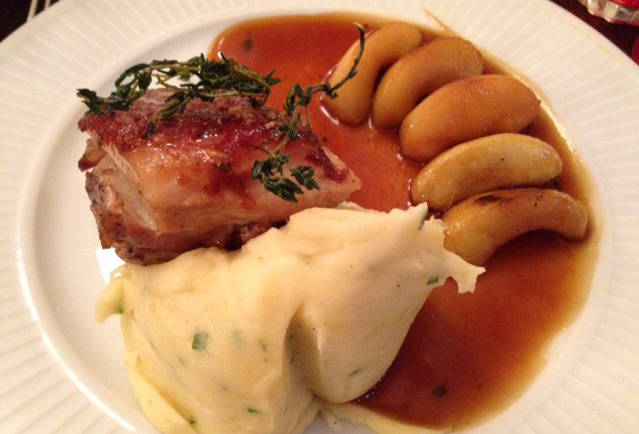 The roast duck was served with a creamh gratin potato and a griottine cherry sauce. The sauce added a sweet element to the dish, and complementing the duck perfectly, while the gratin potato provided just enough to ensure the dish wasn’t too sweet. The cherries in the sauce added a sharp but welcome kick to the dish. The duck was served pink, so those of you who like your meat well done, this may not be a dish for you. Before we started our dessert, we enjoyed a Kir Royale, and this just set us up nicely for our sweet course. We both enjoy a Crème Brûlée for dessert and once we seen the menu, it was the only thing that was really crying out to us. 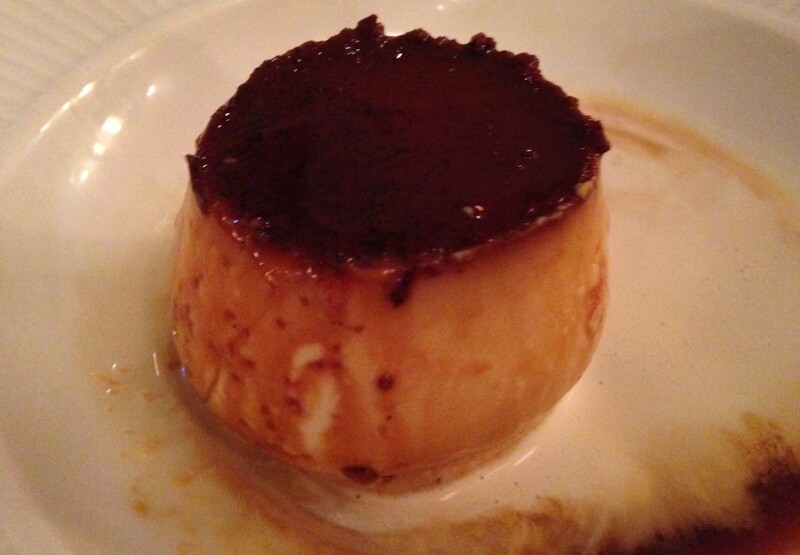 The Brûlée was light and creamy with an intense and crispy caramel top. This really set off the dish and was the perfect sweet ending for this meal. Overall, we were extremely impressed with the surroundings, food and service at Côte Brighton, and will certainly be returning on our next trip to the seaside resort. With quality food at an extremely affordable price, we’d be crazy not to go back, although we will be looking to try out other restaurants on our next visit to the town. Côte have a range of restaurants spread across England and Wales, and we would certainly recommend trying it out if it is in your city, or if you are ever in the Brighton area. You can check out the locations of Côte Restaurants in the UK here, or view their menu online here. Have you ever dined at a Côte Restaurant? We would love to hear from you if you have ever dined at Côte, particularly the Brighton establishment. Let us know about your experience of Côte by commenting below or connecting with us on Facebook and Twitter.